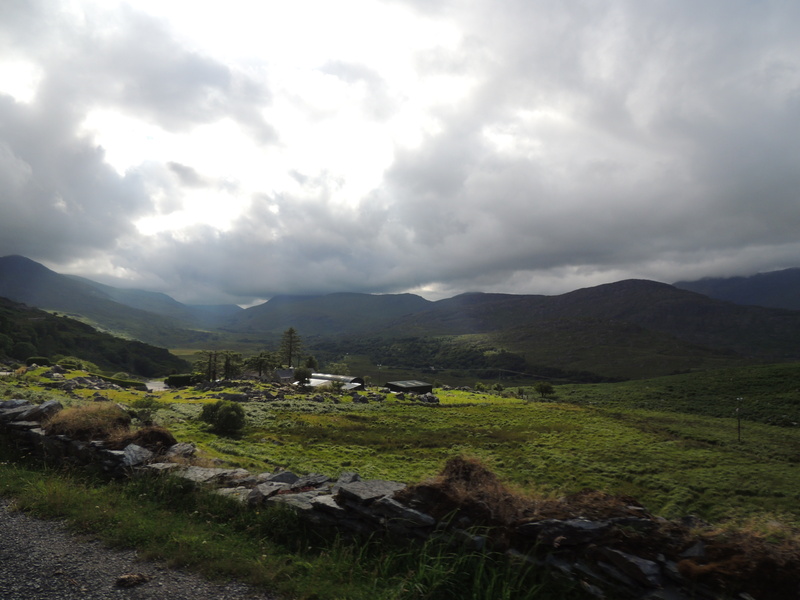 There is much to write about our journey from Donegal to Killarney. I could write about our brief night out in Galway where we caught glimpses of the World Cup finale and an even shorter snippet of live music at a bar. I could mention the windy journey along the Cliffs of Moher in the rain, and how we forwent a trip to the Arin Islands as the boat service was suspended. I could write about the drive through the Burren and the claustrophobic, narrow roads. There’s much to be said for Killarney, where we finally got a night out on the town – and Allison finally got a whippy. But there’s a better story to be told about our final night in Ireland. It should be said that, thus far, accommodations had been varied and very satisfactory. We’d stayed in a hotel over a pub in Dublin, Simon’s house-to-be-renovated in the north, the cottage in Donegal, a cozy hotel in Galway, the very classy Lake Hotel in Killarney, and a humble bed and breakfast, also in Killarney. We hadn’t booked a place in Limerick for our last night, though Jono had offered up his home in Shannon. Miscommunication and a lack of WIFI on Jono’s part left us booking what seemed like an OK place in Limerick, so we could be close to the airport. Our final day in Ireland consisted of driving the Ring of Kerry, which the Lonely Planet claimed one should allot an entire day for. There are so many sights to see along the way, it’s worth allocating an entire day to see everything. We set out under sunny skies – we were truly fortunate for the weather we got – and attempted to avoid tourist buses, as we’d been warned they were nightmarish to be caught behind. Luckily, we did avoid them. We fully utilized our hazards and pulled over along pristine Irish coastline for photographs. 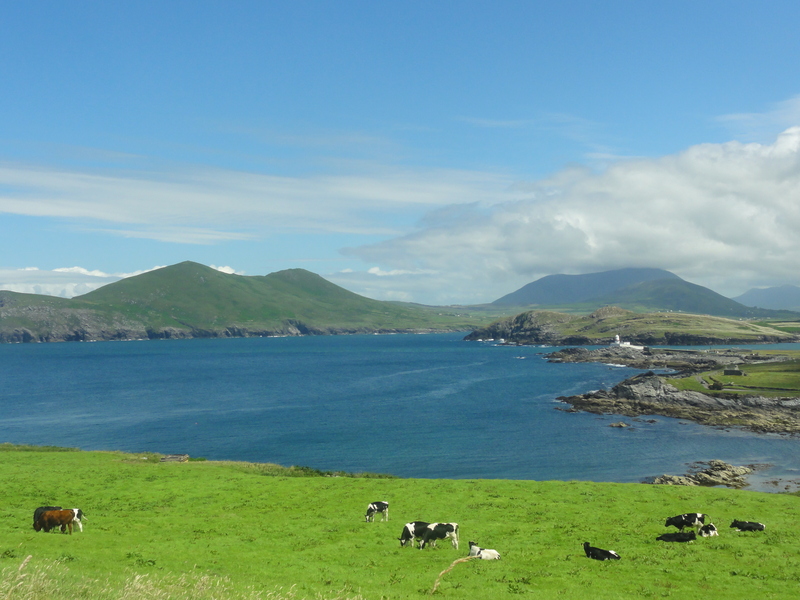 From the beginning, Kacey had been yearning for a photograph capturing Ireland’s famous greens and blues. At our first stop on the Ring of Kerry, she got it. Here, the sea met the land in a beautiful marriage of sandy coastline studded with sheep who looked adorably out of place waddling along the beach. It was the epitome of Ireland. 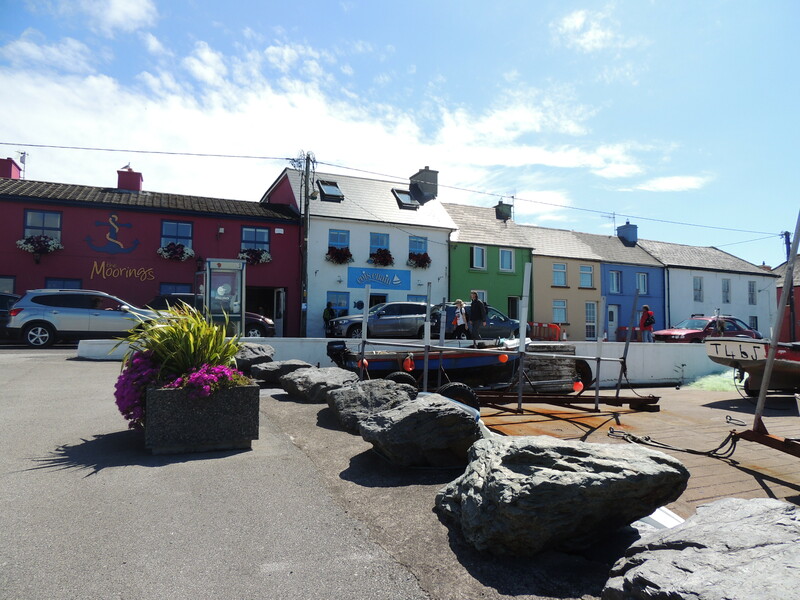 We followed Kacey’s carefully mapped route to Valentia, an island that seemed equally out of place in Ireland, and then on to Port Magee, a salty seaside town where we stopped for lunch and to explore its landmark anchor alongside a clipping from “Sea Fever” engraved on a plaque commemorating lost sailors. Its colorful houses and storefronts made for many a photograph. The only place we hoped to see next was Caherdaniel, a beach that Simon had praised as being one of the most beautiful in the country. 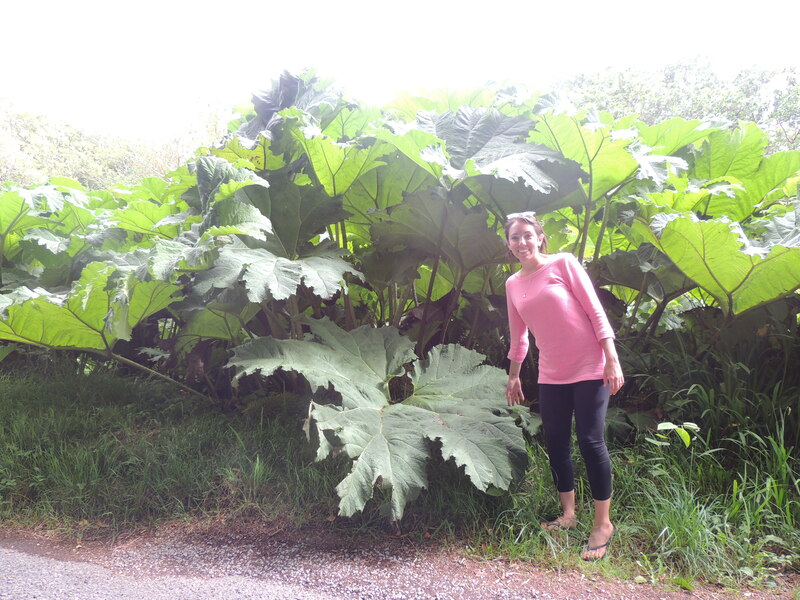 I wasn’t sure what to expect, but when we pulled into the parking lot, past the dinosaurian ferns, we found a little patch of beachy paradise in Ireland. Again, the crystal water and the various shades of greens and blues were enough to take your breath away. We would have spent more time there, but we were already late getting on the road and we had a date to keep. 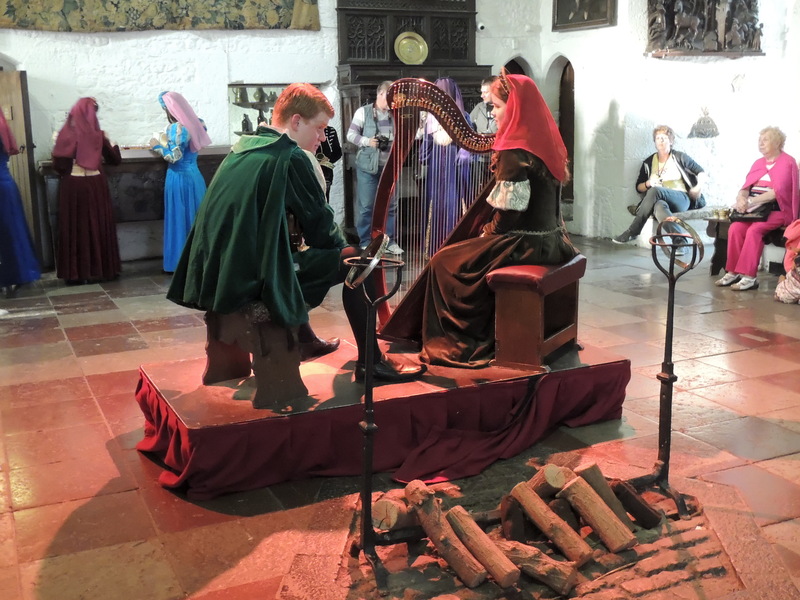 Kacey’s parents, who had recommended Lake Hotel in Killarney, had also recommended the medieval banquet at Bunratty Castle near Limerick. And since we didn’t get to sleep in a castle, we figured a medieval feast would be the next best thing. Unfortunately for us, it was a two-hour drive from Killarney, and we were in Kerry. Even more unfortunately, for the first time on our entire trip, we got stuck behind a lumbering bus – on a very narrow, mostly one-lane road. This was a problem, because with all of the stopping and foot-trekking and exploring, we had all become very sweaty. And stinky. And being stuck in a car for another three hours did nothing to ameliorate our aromas. There’s a very special bodily odor that ferments in long car drives, and we all had it. 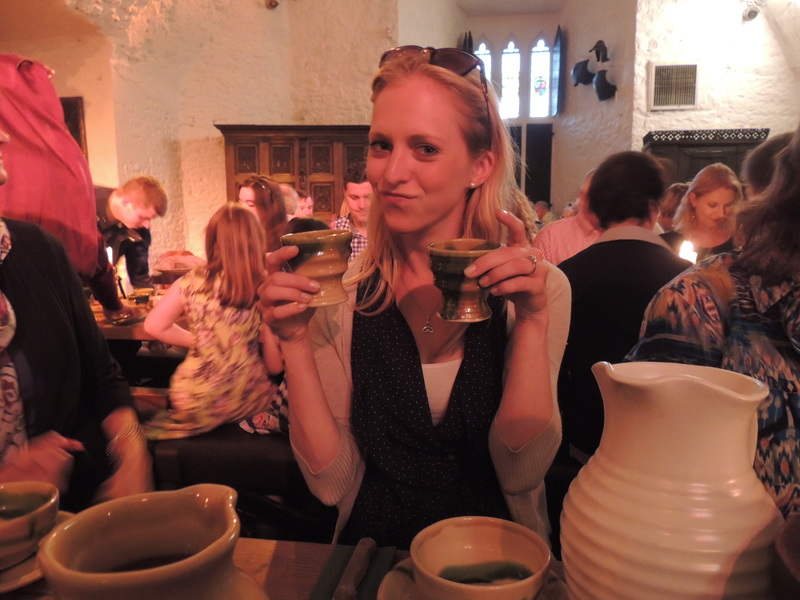 We weren’t keen on arriving at the banquet smelling like medieval guests – there’s a limit on how medieval this banquet would tolerate – and we’d hoped to stop at our Limerick hotel to freshen up before going, but time did not allow for this. Even as I sped down the motorway in 6th gear, with Allison singing loudly in the backseat, we did nothing to cut time off of our journey. We arrived in the parking lot with enough time to change our jeans before rushing into the castle reception, where we were quickly whisked past a bagpiper, up a spiral staircase, and into the main hall, where a red-haired violinist and a very young harpist sat in medieval garb, playing lively tunes. Sweaty and full-bladdered – we hadn’t used the bathroom in hours and had been hurried into the banquet so quickly that we didn’t think we’d have time – we sidled along a major wall, our stench driving wholesome families and well-meaning elderly far away from us. She offered us a wooden bowl full of bread cubes and what looked like salt to dip the bread in. “Is that salt?” Kacey asked. He invited us down to the banquet hall, where we were seated on a bench, squeezed between small families and couples. Very quickly, we discovered that our neighbors all hailed from the good ol’ USA. There were soccer moms from North Dakota to our left and extremely enthusiastic medieval-philes from Georgia to the right. We feasted with our hands on tasty food, and enjoyed some singing until Chris took the stage and made a “grave” announcement. We all turned to the table behind us where a father was being taken from his family and led down to the dungeon. I wondered if all of this had been planned, and then panicked, wondering of one of us might be selected to get up and do something. John was brought before the banquet hall and forced to sing a song for redemption. And so, in a medieval Irish castle, the guests erupted into a loud rendition of the anthem of America’s favorite pastime. The evening was very entertaining, and the food was excellent, but by the time we got back to the car, we were tired, dirty, and giddy from the festivities. Excited at the prospect of clean sheets and a comfy hotel, we sped on into Limerick, only to get completely lost on its myriad one-way streets and, quickly, frustrated. Kacey found the hotel while Allison and I drove around searching for parking. We settled on a spot in the road and lugged our cases up a stairwell. We’d decided that Limerick seemed fairly seedy and had little hope for our hotel by this point – which was a good thing. The receptionist was friendly enough, but our room was located down a dim hallway with flickering lights. On the wall, a very creepy painting hung, with ghastly faces staring in the direction of our beds. Allison tried to cover them with a duvet cover, but with no success. I had barely gotten ready for the shower when suddenly, the ear-piercing scream of the fire alarm burst the silence of the room. No big deal, right? Just someone smoking. Needless to say, we didn’t do well sleeping that night and were extremely grateful to depart for the airport early the next morning. It is always with a bit of sadness that a trip comes to a close. At the airport, Allison and Kacey were catching the 9am flight back to New Jersey, while I was to await a 2:30pm flight to Heathrow to start my next leg of the journey. We said farewell over coffee and breakfast, and I was left to reflect on our fun-filled, sometimes hectic, otherwise extraordinary nine days in Ireland. As far as trips go, it is certainly one of my favorite. Fun travel companions and a wild, beautiful country open to exploration – you can’t go wrong. got to love Ireland it is the most beautiful country.